Thurgood Marshall (1908-1993) was born in Baltimore, Maryland. In 1930 he was denied admission to the University of Maryland Law School because he was black. He then sought admission to, was accepted at, and graduated from the Howard University Law School. Marshall became Chief Counsel for the National Association for the Advancement of Colored People (NAACP) in 1940, and as such successfully argued several cases before the U.S. Supreme Court including the landmark 1954 Brown v. Board of Education of Topeka, Kansas case. Thurgood Marshall was appointed and confirmed as an Associate Justice to the U.S. Supreme Court in 1967 and served as a Supreme Court Justice until his retirement in 1991. He is the nation’s first African-American to serve on the Supreme Court. The “Abort the Court” button depicted on this page, we believe is a reference to several abortion cases which came up before the Supreme Court in 1977. Marshall, along with Supreme Court Justices William Joseph Brennan, Jr. (1906-1997) and Harry A. Blackmun (1908-1999) were all three supporters of abortion rights and all three dissented from the majority opinion which upheld certain funding and other abortion restrictions in each of these cases. Charles B. Rangel (1930- ), a Democrat, has served and been re-elected to the U.S. House of Representatives from 1971 to the present. He defeated Adam Clayton Powell, Jr. (1908-1972) in the June 1970 New York Democratic Primary, and went on to win his Congressional seat in the November 1970 General Election. Rangel is an original member of the Congressional Black Caucus which was established in 1971. 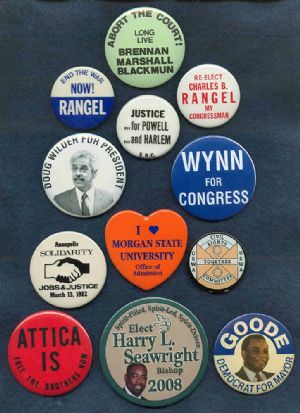 The “End the War” button is indicative of Rangel’s early years when he opposed military spending and the bombing of Cambodia during the Vietnam War. The other button is from his 1976 re-election campaign. The Southern Regional Council (S.R.C.) was founded in 1919 and has had as its mission the purpose of fighting racial injustice. In the 1930s it worked against lynching. In the 1950s it worked to implement the Brown v. Board of Education ruling, and in the 1960s it took on voter education. The button portrayed here portrays S.R.C. support for Adam Clayton Powell, Jr. (1908-1972) who in the late 1960s Congress sought to exclude from membership following an investigation pertaining to alleged corruption and the misuse of funds. Powell’s New York City Congressional District included Harlem. L. Doug Wilder (1931- ), was elected Governor of Virginia in 1989, and served as Governor of Virginia from 1990-1994. He is the first African-American to be elected not only as Governor of Virginia, but as Governor of any state in America. Wilder was a declared candidate for the Democratic Party’s presidential nomination in 1992, but withdrew during the primaries. Wilder would later be elected in 2004 and serve as mayor of Richmond from 2005-2009. Albert Russell “Al” Wynn (1951- ), a Democrat, won election in 1992 and was re-elected seven times representing Maryland’s Fourth Congressional District from 1993-2008, at which time he was defeated in his re-election bid. W. Wilson Goode (1938- ), a Democrat, is the first African-American to be elected Mayor of Philadelphia, Pennsylvania. Elected in 1983, Wilson was re-elected in 1988, thus serving from 1984-1992. Goode was prohibited by law from seeking a third term as Mayor of Philadelphia. It should be noted that Wilson Goode received his undergraduate degree in 1961 from Maryland’s Morgan State University. The African Methodist Episcopal Church (A.M.E. Church) was founded by a former slave, Bishop Richard Allen (1760-1831) in Philadelphia, Pennsylvania in 1816. On a national organizational level, the A.M.E. church is divided into twenty districts, each with a presiding Bishop. These Bishops are elected every four years and basically serve as the executive board for the church. The Cumberland A.M.E. Church is included within District 2 which covers Maryland, Virginia, North Carolina, and Washington, D.C. The button portrayed on this page is from Reverend Harry L. Seawright’s 2008 attempt to be elected Bishop of District 2. Seawright is Pastor of the Union Bethel A.M.E. Church in Baltimore. Though unsuccessful in 2008, he is again a candidate for 2012. Morgan State University is located in the City of Baltimore, Maryland. It was founded in 1867 by the Baltimore Conference of the Methodist Episcopal Church and originally known as the Centenary Biblical Institute. Though its mission was to initially train young men for the ministry, the school later enlarged its purpose to education both women and men as teachers. The school was renamed Morgan State College in 1890 in honor of Reverend Lyttleton Morgan, who served as the school’s first Board of Trustees Chairman. Morgan remained a private school until 1939 when it was acquired by the State of Maryland. It then became known as Morgan State College. This was partly due to a state need to provide educational opportunities for its African-American citizens, as well as the state’s desire to hold off on integrating the University of Maryland. In 1975 the Maryland State Legislature formally designated the school as Morgan State University. Morgan is one of four historically black colleges in Maryland, the other three being Bowie State University, Coppin State University, and the University of Maryland, Eastern Shore. In 1948 the United Steelworkers of America (USWA) established their International Committee on Civil Rights. With the coming of the 1964 Civil Rights and 1965 Voting Rights Acts this committee was reorganized to focus more closely on ending discrimination in the workplace. In the years that followed training and apprenticeship programs and hiring increased for African-Americans and women. It was also during this period that Civil Rights Committees began to be established within the local unions. Today, each local USWA union is required by the Constitution of the International Union to have a Civil Rights Committee, their purpose being to protect the civil rights of all employees, further equal employment opportunity, and generally work toward the objectives of the Civil Rights Act of 1964. This particular USWA Civil Rights Committee button is apparently highlighting the union’s women members. The Attica Correctional Facility is a state prison located in Attica, New York. On September 9, 1971 the Attica prison riot took place in which over 1,200 prisoners, out of a prison population of about 2,200, took control of the facility taking over thirty correctional officers as hostage. The major reason cited for the riot was a demand for better living conditions. Although some of the specific demands were agreed to, others were not, including amnesty for the rioters. Negotiations with the State of New York eventually failed and on September 13, 1971 state police and prison guards stormed and took control of the prison by force. Forty-three persons died as a result including ten of the hostages. The Annapolis Solidarity Day button pertains to a 1982 march in Maryland’s state capital that took place to protest not only federal budget cuts in social programs, but the ongoing increase in military spending. Religious groups, labor unions, civil rights and state-wide community activists, numbering about 4,000 strong, marched from the Navy-Marine Corps Memorial Stadium to the Annapolis State House to protest these policies.